So, in each iteration, the value of start and end position changes e.g. at first, start=0 and end=length-1 but then depending upon the value of target element we move the pointer to first or second half of array. This gives you the base case i.e. since the array is getting smaller and smaller in every iteration at one point it will limit to just one element and after that end will be less than the start. At this point, you can stop the binary search because now you cannot divide the array further, which means element doesn't exist in the array. Our solution return -1 at this point of time. Now, some of you might ask why should we learn a recursive algorithm if you already know an iterative one? Well, there are many reasons to do it e.g. if you are preparing for the job interview, you must know both solutions because interviewer prefers candidates who are good at recursion. Second, recursion is a tricky concept to master and it's in your best interest to learn and master it. There are many programmers who struggle to understand recursion and as per my experience, I have found programmers who understand recursion better are comparative good coder and programmer than those who don't understand a recursive solution or struggle to use recursion in code. If you are one of them then I strongly suggest you read a new algorithm book called Grokking Algorithm by Aditya Bhargava. 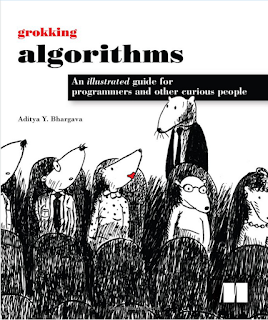 It's a refreshing book which takes a different and more real life approach to teaching you algorithms. Here is our complete Java solution to implement a recursive binary search. I have a public method recursiveBinarySearch(int input, int key), which takes an integer array and a number as key which we need to search in the array. This method return index of key if it is found in array otherwise it return -1 to indicate that key doesn't exists in array. This method doesn't do anything except accepting parameters from the caller. It then calls the binarySearch(int array, int start, int end, int target) which actually performs the binary search. I have made this method a private method because it's an internal method and should not be exposed to client or public. This gives you an option to rather switch to a better or iterative algorithm without any change on the client side because they will be keep calling the public recursiveBinarySearch(int input, int key) method. Now the recursive logic is very simple, we calculate middle index by using start and end parameter passed to this method, which 0 and length - 1 at the start. After that, we retrieve middle element and compare it with the key or target. If it's equal then we return the index otherwise, we repeat the binary search in the first half or second half of array depending upon whether the key is smaller than the middle element or larger than the key. To repeat the binary search, we call the same method with a new start and end parameter e.g. start becomes start = middle + 1 if we are searching for second half of array and end becomes end = middle - 1 if you are searching for first half of the array. Since we are calling the same binarySearch() method, this solution becomes recursive. If you want to learn more about recursion and binary search algorithm, you can also read Introduction to Algorithms, one of the most recommended books to learn Data structure and algorithms. 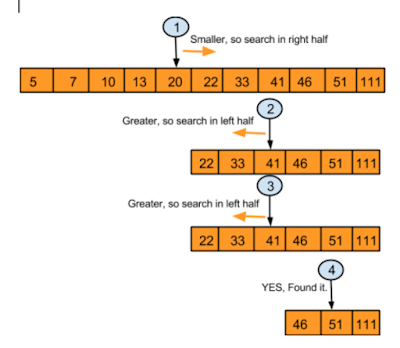 That's all about how to do the binary search using Recursion in Java. If you did the iterative implementation you will notice that recursive binary search is much simpler than iterative one because the process is naturally recursive. We are repeating the same process again and again and at every iteration, the problem set becomes smaller and smaller, this is the key to the recursive problem. As I told you, if you understand recursion but struggle to come up with recursive solution reading Grokking Algorithms can help you a lot.